Putting Nvidia's mobile 10-series claims to the test. The promise of gaming notebooks has long been the ability to experience desktop gaming on the go. While there have been a few select instances where we came close, in general the best we've been able to do is around a 30 percent deficit for similar hardware names—i.e., GTX 970M vs. desktop GTX 970, or HD 7970M vs. desktop HD 7970. Nvidia's new GeForce 10-series graphics chips for notebooks takes that old way of doing things and kicks it to the curb, giving us notebook parts that are very nearly the equal of the desktop chips. Clockspeeds may be slightly slower, but power draw is also lower and the net result is that this year's 10-series notebooks are as close as we've ever come to having legitimate desktop replacement notebooks at mainstream prices. MSI's GS73VR is the first 10-series notebook we've received for testing, but more are on the way. (MSI's GT83VR arrived a few days after the GS73VR, but that's a different beast.) This is something of an entry level gaming notebook, since it uses the lowest of the mobile 10-series GPUs. But the GTX 1060 is no gaming slouch, with performance on the desktop that surpasses the GTX 970 and comes close to matching the GTX 980. The question is, how close does the mobile GTX 1060 come to the desktop part? Dimensions: 16.22" x 11.22" x 0.77"
The rest of the specs are equally impressive—16GB RAM, i7-6700HQ processor, 256GB SSD + 1TB HDD, and the usual slate of USB ports and video outputs. The keyboard comes with full RGB backlighting and has decent action, along with macro key support thanks to MSI's SteelSeries partnership. The touchpad is a bit finicky at times but nothing too bad, and you'll want a separate mouse for gaming regardless. The notebook includes a 120Hz 1920x1080 IPS display, which is an interesting choice. It's not a G-Sync panel, but the higher refresh rate largely negates that deficit, and in some ways it's preferable to a 75Hz G-Sync display. I'd be curious to know the difference in price—is this 120Hz panel more expensive or less expensive than a G-Sync panel?—but either way it's better than a bog standard 60Hz display. That's on other GS73VR models, along with the option for a 60Hz 4K. What you won't find is a G-Sync option. GTX 1060 isn't just faster than the GTX 970M, it also beats the GTX 980M. While Nvidia has technically abandoned the GTX M-series parts for notebooks, they didn't magically make notebook GPUs faster without some compromises. The new GTX 1060 appears to use roughly the same amount of power as the previous generation GTX 970M (it was about 5-10W, though the two notebooks aren't identical), and quite a bit more power than the GTX 960M. This also isn't the first time Nvidia has done this, with last years GTX 980 for Notebooks sporting a fully enabled GM104 chip with similar performance to the desktop part. The good news is that the GTX 1060 isn't just faster than the GTX 970M, it also beats the GTX 980M (while using around 20W less power). It's two different facets of the new Pascal architecture and 16nm FinFET: Better performance on the one hand, and lower power use on the other, balanced against each other. Other than the new graphics chip, the new GS73VR is largely the same design as last year's GS72 Stealth Pro. It's a slim notebook with a large display, using a nice looking aluminum chassis that unfortunately can be a bit of a fingerprint magnet. The name also gives away one of MSI's selling points for their new 10-series notebooks, that they're all VR ready. The importance of that aspect is a matter of debate, and you still need all the other VR peripheral equipment (sensor and HMD for Oculus, or the HMD and lighthouses for the Vive). I haven't seen any killer VR games or apps yet, but the option is there if you want it. The 3-cell battery might look a bit small, but it keeps the size and weight down. There was a time when 3-cell and 4-cell batteries were pretty dismal (around 30Wh), but the GS73VR has a 65Wh battery capacity, which means battery life shouldn't be too bad. When you're not gaming, Nvidia's Optimus Technology also shuts off the discrete graphics. I measured a bit less than 3.5 hours of 1080p video playback, which is nearly an hour longer than the Asus G752Vt managed in the same test. Clock speeds are quite a bit lower than on a desktop i7-6700K, by 700MHz to as much as 1400MHz, depending on the workload. The result is performance just slightly lower than a stock clocked i5-6600K, with Hyper-Threading helping to close the distance in multi-threaded tests. The 45W TDP (Thermal Design Power) causes at least one test (y-cruncher) to drop CPU clocks down to 2.6GHz for example, giving the desktop i5-6600K a 25 percent lead, but overall it's only about a five percent advantage. For graphics testing, I wanted to start by comparing the mobile GTX 1060 to desktop parts. I've also included results for a GTX 970M, which is currently the only other mobile GPU where I've run a full suite of gaming benchmarks at 1080p. Performance is good and comes relatively close to the test desktop equipped with a GTX 1060 6GB, though it's not quite there. Some of that is due to the slower CPU, but TDP is the bigger factor. The desktop GTX 1060 is a 120W part. Nvidia doesn't officially disclose their notebook GPU TDPs—and the notebook manufacturers have some flexibility in setting power targets—but based on testing I'd peg the notebook GTX 1060 at closer to 80W max (the same TDP as the GTX 970M). 10 percent lower performance while using 30 percent less power is a good tradeoff. Going up against other gaming notebooks, the GTX 1060 looks even better. It's not quite able to catch the full GTX 980, but it has a significant 50 percent lead over the GTX 970M, which means it also beats the GTX 980M by around 20 percent. It's still not capable of running Ultra settings at 1080p and 60fps in every game, though—never mind the 120fps needed to max out the display's refresh rate. But what happens if you reduce the quality settings to medium? Virtually every game is well above the 60fps mark (Ashes being the one exception, falling a couple of fps short), though >120fps is only achieved in five of the 16 games. Running games at high quality should basically split the difference between these two charts, giving some flexibility if you want to tweak a few settings. Overall, both the GTX 1060 and the MSI GS73VR deliver an impressive showing, and people looking for a good gaming notebook should give the GS73VR serious consideration. What about pricing, though—how does the $1,800 / £1,768 MSI GS73VR stack up against a desktop with similar performance and components? The above gives a partial list of components, totaling around $860 / £760, but a notebook is a complete system. If you include a keyboard, mouse, and Windows 10 Home, you're looking at $1,300 / £1,225, and you're still missing the display. I couldn't find an IPS 1080p 120Hz monitor, but the Asus 24-inch 144Hz TN display is good, giving a final total of around $1,550 / £1,450. You give up portability and mobility (no battery) and save about $250 / £320 in the process, though the desktop obviously has better upgrade/expansion options. From the perspective of someone buying a complete system, it's about 20 percent more money to go mobile and you lose about 10 percent in performance. If that doesn't sound good, just last year a notebook with a GTX 980M was about 15 percent slower than a desktop with a GTX 970, and it cost around $2200 (40 percent more), or a GTX 970M was 35 percent slower for about the same price. There are other ways to look at the pricing, of course—you don't need often need a new display, keyboard, and mouse with a new desktop—but mobile gaming warriors just took a big chunk out of the performance deficit thanks to Nvidia's 10-series mobile GPUs. I've been using and testing laptops for years, and the latest gaming notebooks show great progress. The thing you need to consider when looking at gaming notebooks and laptops is how you plan to use it. If you're looking for a system that can handle games but also make it through a day of classes while you carry it around campus, the GS73VR is bigger than I'd want to haul around. Battery life is decent but also likely to come up short if you're not able to plug in periodically throughout the day, meaning you'll need to pack along the AC adapter as well. But if you want a bigger display when you're playing games at a LAN party, watching movies, or just surfing the Internet, there's plenty to like. I've now used several G-Sync enabled laptops, and it's a cool feature to have—it makes falling below 60 fps far less of a problem. Depending on your graphics card, having a variable refresh rate can be better than a higher static refresh rate, but in practice I didn't really notice the lack of G-Sync here. That's because instead of refreshing every 16.7ms, the 120Hz panel updates every 8.3ms—maybe it's all in my head (or my eyes), but tearing and stuttering never really bothered me with this display. If you want a bigger display when you're playing games at a LAN party, watching movies, or just surfing the Internet, the GS73VR has plenty to like. Perhaps the best part about the GS73VR is that it doesn't have any serious flaws. You might think that's a small hurdle to clear, but so many laptops fall short in one or two key areas. For the intended users—gamers who don't mind carrying around a slightly larger notebook—the only real concern is how long this notebook will remain a viable gaming system, because upgrading a notebook usually means selling your old system and buying a replacement. GTX 1060 is brand new, it's faster than the old GTX 970M as well as the GTX 980M, and for gaming notebooks it's priced appropriately. If you're willing to run at lower quality settings as games become more demanding, the GS73VR should last at least three years, and maybe more. 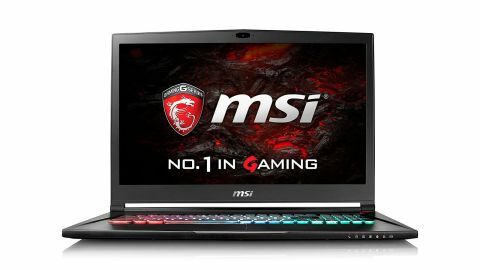 MSI offers several other gaming notebooks with the GTX 1060 that are also worth a look, with prices starting around $1,500 / £1,300, but I like the 256GB SSD as a minimum for the OS drive, so spending a bit extra isn't a bad idea. If you want something a bit smaller, the GS43VR and GS63VR have 14-inch and 15.6-inch displays, respectively.